Hi! I grew up in the suburbs of Houston. I graduated with a B.S. in Mathematics from Howard Payne University and a Master of Business Administration (MBA) from the University of Houston. I hold a Lifetime Texas Teacher Certificate. After teaching Junior High & High School math in Klein and Cypress-Fairbanks ISDs, I was recruited into the tutoring and test preparation industry where I was promoted to be the Director of the Houston Area. My husband and I eventually started our own training company. I just love teaching math and I've been told my passion for math is contagious! I believe this joyous disposition creates an environment conducive to learning for my students no matter their math understanding or background. My experience teaching math students of all levels allows me to reach students who have previously struggled with math and to further enlighten students with a natural bent towards math. My husband and I still live in Northwest Houston and have two children. The top left picture is of us at Animal Kingdom (Disney World). 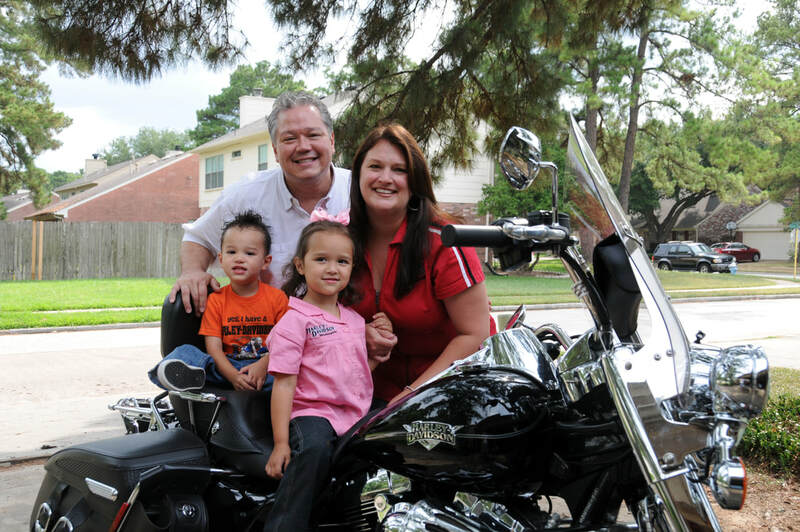 The top right picture is us on my husband's "baby", his Harley Davidson Motorcycle! My parents live 5 minutes away and are involved in our daily life. Our church, The Fellowship of Champions, is also a very important part of our life. Our pastor's home flooded during Hurricane Harvey and their family of five lived with us for 3 months. My husband and I also lead a Home Group Bible Study and I am the worship leader. "I want to thank you for your teaching over the year. Math is something I've always struggled with, so you taking extra time coaching me along means more to me than I can say. Thank you for helping me realize that I can rise to the challenge. It's something no one else has been able to do." "Thank you so much for teaching me, I have never liked math but having you as a teacher has made me actually enjoy learning. Thanks to you I have never dreaded a Tuesday or Thursday morning (sometimes I actually look forward to it." "Here is my completed final exam. I really enjoyed class! I think I learned more about math this year than I have every other year combined! Thanks so much!" "Mrs. Edwards is kind, understanding, and knowledgeable. My daughter and I do not speak the same math language so Mrs. Edwards has been a tremendous help to solidify concepts already introduced and teach new ones." "Mrs. Edwards is THE BEST! I’ve recommended several families try HSML due to our experience with her. She absolutely cares about her students and makes every effort to help them be successful in math. We picked our course this year based on what Mrs. Edwards was teaching." "I highly recommend Christy Edwards from HSML. She has taught all three of our kids and they have all excelled with her. Even my daughter who didn't like math at all got an A in her class and she actually enjoyed math after having her!" "Mrs. Edwards is the perfect math teacher! Knowledgeable, explains things well, engages the students with questions during class so that they are accountable, and truly cares about their success. We could not be more blessed to have had her for Algebra 1 and 2. So, so thankful!" "Thank you so much for all your work with my student; I can honestly say he is loving math again! After several years of Saxon, I thought I had lost his love of math forever. Now, there is no fight or fuss about doing math or getting online for the class. It has been such a relief for all of us! Thank you!" "Thank you for being such a dedicated and wonderful teacher to our daughter. She thoroughly enjoyed being part of your Algebra 1 class. You made the class material easy to follow and her love of math has only increased because of you. We look forward to our younger daughter joining your class in the future."